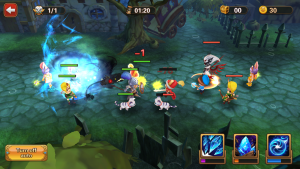 From the outside, Hero Legends looks like another overhyped mobile game from Japan. Giant monsters, weird Anime style characters, and lots and lots of explosions and magic. It also gives an appearance of trying to be the best of many different styles of games. I’m usually the first to say that less is more but when a game can incorporate all parts to work together, I’d say you have a pretty solid game on your hands. Fortunately, that’s exactly what Hero Legends delivers. Starting the game up, we are presented with a brief backstory of what is happening in the kingdom, and we are taught what our role is as a hero; we are here to lead our troops into battle and protect the kingdom! You are given a hero character, all of which are incredibly unique. To start off I was given an Ice Princess with rabbit ears. Bunny Elsa (as I chose to call her) was accompanied by 4 other soldiers, archers, and mages, and proceeds to wreck an opposing team in battle. Battles are pretty straightforward. All characters attack and move on their own, but you are in charge of your hero’s abilities. These abilities range from direct attacks, area-of-effect spells, damage boosts, regen abilities. Each hero only has 3 abilities, so it’s important to think about what your team may need as you get further on in the game. Early on, however, your team will be devastating, and the tutorials will set you up to success as you go deeper. Battles move fluidly, are beautifully animated, and are colorful and exciting to watch. After your unprecedented first victory, you are brought to the first screen of your island town. This screen initially doesn’t have much unlocked, but it does have your current objectives and is where you access further missions and battles from. Completing more missions gives you rewards and levels up your team ranking. After a few more missions are complete, you are then brought to the let side of your island by swiping. This brings you to a lovely little town setting with barracks, a library, a church, a tavern, and several other buildings. You are taught how to recruit more heroes, but also how to recruit more soldier. You see every time a soldier takes a hit, you loose troops of that type. Run out of all your troops, and that type of soldier is no longer selectable. For example, let’s say I had 500 Knight troops. Those 500 troops are basically my Knight’s health. After each battle it’s important to go into the barracks and train more troops because depending the type of recruit, it will take a decent amount of time to finish the training, and since you can only initially train 3 troop types at a time, your queue will fill up fast if you aren’t doing it regularly. There’s a LOT to do on your island. The other buildings allow you to raise the stats and abilities of your troops. The library, for example, contains upgrades for all mage-type characters, including spell strength, duration of spells, the amount of healing done, and armor strength. It’s important to keep all your troops upgraded as much as possible first and foremost for combat purposes, but also because different upgrades for troops are required before you can upgrade buildings to upgrade troops even further. There are dozens of troops for each type, some who physically attack, others who are ranged fighters, so team composition is very diverse and can be mixed up for every situation. Finally, the last section of your island is your farmland and lumber mill. You have resources that need to be harvested every once in a while. You have a gold mine for easy money, a farm that produces food, and a mill that gives you wood. Food is used when recruiting troops, so you will need a lot of it constantly. Wood is used in building upgrades, so again you’ll need a lot because you’ll be constantly upgrading. Money is used for everything, so just like in real life, you’re going to want to keep saving it up. This isn’t as in-depth as a regular farming simulator or island making game, but it is integral to the gameplay, so you’ll want to make sure you are keeping an eye on it, harvesting when you can, and making upgrades so that you can keep your production ahead of your need for supplies. Everything can be upgraded, which gives your access to more upgrades, so that you can upgrade your upgrades. After learning your way around the other parts of the world, you are brought back to the first screen where everything starts unlocking. 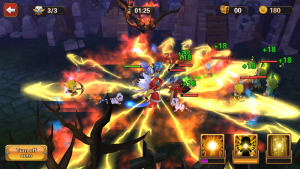 You will have Colosseum battles where you can attack other people’s teams, the Trial Altar where you can compete in very difficult event-like battles for unique treasures, the Observatory to unlock special hero attributes, and the Adventurer’s Guild that allows you to compete against other people for exclusive items. 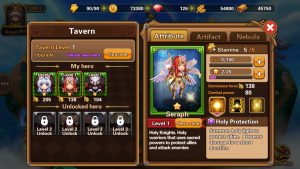 These rare items are used for special building upgrades at higher levels or allow you to boost different areas of your heroes’ stats. You can also travel to the world map and see islands that are around you to expand your kingdom. After the capture of the initial set of islands and upon reaching a certain level, you will then be opened up to the world with other players competing for ownership over islands and their resources, so it’s important to capture land quick so it’s under your protection. To the victor go the spoils. Also, the game named me Angel.PITTS… so that’s a thing. As I said from the get go, there’s a lot in this game. You have your strategy of team building for each situation, a town upgrade system, fields and woods to harvest, special boss fights, territories to take over, and some PVP fights. It’s a lot for all one game, but Hero Legends manages to put it all in there and provide quality to each of these areas. Farming and harvesting isn’t as fleshed out as an actual farming simulator, and the town upgrades aren’t as complex as Sim City, but being able to upgrade a Church to boost my holy warriors is a lot more fun than scrolling through a menu and clicking a button. It causes you to feel more invested in what’s happening because it’s not just a menu that you’re scrolling through. It’s your town on your island in your kingdom. It’s not the first game to present a system like this, but it does it well and makes it fun. Looking forward, there has been talk in the app that there are event’s planned, but at the time of this writing, there isn’t a current event happening. 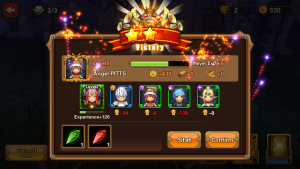 Eventually, there will be events that allow for the earning of unique troops, rare items, and rare heroes. It’s cool to see that content like this is planned, and with enough popularity, I could see this becoming an app that gets continued support for a long time. The only area where this game falls a little short for me is in its translation. Every once in a while there will be text, especially on the victory screen, that still is in Japanese. It’s only ever a character name so it’s hardly crucial, but it’s still there. There are also parts of the occasional dialog that pops up that has a few grammatical errors, probably from the translation. These are just minor details and I never had a hard time figuring out what it meant to say, but it’s still there nonetheless. Hero Legends does a lot of things, but it does them all right. It incorporates ideas from several different styles of games, ties them all together to make sense (recruiting soldiers requires that you feed them, so go harvest some food!) and doesn’t try to overcomplicate any one part of it. There’s a huge cast of characters to obtain and use, each with their own attributes. It’s a great looking game with lots to do, events promised, and multiplayer components. Some might be turned off by its anime style artwork, but if that doesn’t bother you, you have a real gem of a game. This game is fantastic. There's loads to do. 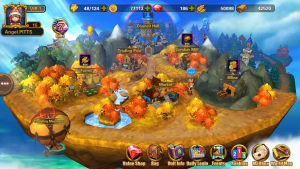 You'll find yourself sucked in for the long haul trying to upgrade all your troops so you can expand your turf, win competitions, and gain some serious loot. If you can look past the occasional translation error, you're in for a real treat.